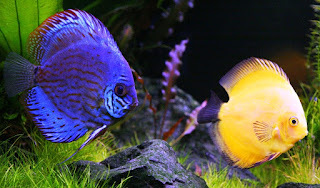 Ornamental fish farming is a farming which specialize to produce ornamental fish commercially in enclosures or tanks. In the world, Singapore is a top exporter of ornamental fish include a wide range of tropical fish such as Japanese koi, discus, cichlids, arowanas, and other ornamental fish. Because of that Singapore is well-known as a “one-stop shop” for global ornamental fish business. Exporters get around 500 species of ornamental fish, buying from local farms (accounts for 40% of sales) and other farms in the region for re-exporting. Sanyo Aquarium is one of Singapore's leading exporter of ornamental freshwater fish, ornamental marine fish & invertebrates, aquatic plants & potted plants. Specialized in breeding quality Koi from leading breeder in Japan. Importer & exporter, grower, wholesaler & retailing of Koi & Food Fish (live Tilapia & Prawns). With this cluster, AVA looks to establish a collaborative framework with exporters and traders to maintain and advance Singapore's position. The cluster’s Chairperson Dr Kenny Yap from Qian Hu Cooperation was appointed by AVA for a 3-year term. Qian Hu Corporation Limited is an integrated ornamental fish service provider with business activities ranging from the breeding of Dragon Fish to farming, importing, exporting and distributing of over 1,000 species and varieties of ornamental fish from all over the world. Qian Hu alseo manufacture and distribute aquarium and pet accessories to local and overseas customer. 4 Responses to "Ornamental Fish Farming in Singapore"